According to The Daily Mail, Chelsea are prepared to let Ruben Loftus-Cheek leave on a season-long loan next season, putting Newcastle, West Ham and Crystal Palace on high alert. Loftus-Cheek is one of a number of Chelsea youngsters who hasn’t yet been given much of a chance in their first-team. The 22-year-old spent last season on loan at Crystal Palace and enjoyed an impressive spell for the Eagles, scoring twice and assisting three goals in 24 appearances. 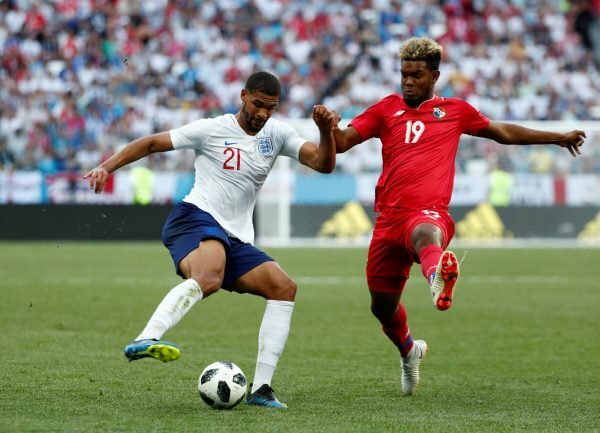 His dominating displays earned him an England call-up and the rangy midfielder has impressed in both World Cup games in which he has featured so far. With Chelsea’s management still up in the air, it is unclear what lies ahead for the Blues, but according to The Daily Mail they want to keep Loftus-Cheek long-term but will allow him to leave on a season-long loan next season. It has been reported that Newcastle are interested in signing Loftus-Cheek but a return to Crystal Palace and a rival bid from West Ham could also be on the cards according to The Daily Mail. There’s no doubting Loftus-Cheek’s quality and it is surprising that Chelsea are willing to let him leave next season when their central midfield could really do with his presence alongside N’Golo Kante. But what is Chelsea’s loss could be Newcastle’s gain if they can convince him to head to the north-east next season. He could be a real star for the Toon alogside Jonjo Shelvey and Loftus-Cheek can be sure of game-time at Newcastle. Kenedy shone for the club during his stint from Chelsea last season and Benitez will feel he can do the same with another player from his former club. In terms of the young player’s development, he would benefit moving to a club outside of London to gain more experience and feel the love from the Toon army, and Benitez would be the perfect coach to take him to that next level and give him the attention he needs. Crystal Palace and West Ham may be the favourites, but with West Ham in contention for other big names and Palace offering more of the same for the England star, a stint at Newcastle would be a great move for both him and the club.